The prime minister has said the UK will then publish a White Paper setting out “in more detail what strong partnership the United Kingdom wants to see with the European Union in the future”. 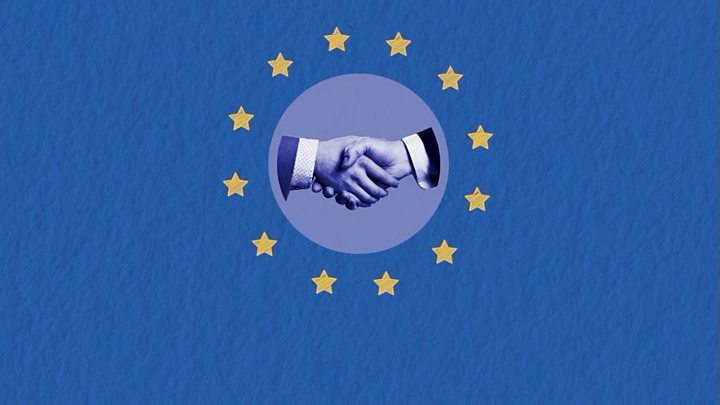 The UK is due to leave the EU on 29 March 2019, and negotiations are taking place on what their future relationship between the UK and the EU will look like. The government had talked publicly about two potential customs options. One, a customs partnership, would mean the UK applies the EU’s own tariffs and rules of origin to all goods arriving in the country and then hands over what was owed for goods that subsequently end up in the EU. The government has now deemed both options practically or politically undeliverable and is working on a third option, believed to involve “alignment” with the EU in regulations covering trade in goods but a looser relationship for services. Mr Rees-Mogg said a deal which restricted the UK’s ability to make trade agreements with other nations or control migration could not be accepted. He said Mrs May had declared the UK would leave the single market and the customs union and “must stick to her righteous cause and deliver what she has said she would”. The government must seize a “great opportunity to do things better” rather than being in a “tremulous state that sees Brexit as mere damage limitation”, he added. But his colleague Vicky Ford said what the vast majority of Tory MPs wanted was a “practical, pragmatic deal that gives certainty to business and trade… not an ideological one”. She told BBC Radio 4’s Today programme that a “crash-out no deal is not acceptable to those who want to support jobs and a partnership with the EU going forward”. And fellow Tory Simon Hoare called for an end to what he said was “hectoring blackmail” of the prime minister. On Saturday, it was revealed that Environment Secretary Michael Gove physically ripped up a report on Mrs May’s previously preferred option for a new customs partnership with the EU. He was said to have been “livid” because he felt the government document downplayed his objections to the proposal. Speaking on the BBC’s Andrew Marr Show, Communities Secretary James Brokenshire said there were “strong views” on both sides but predicted Friday’s away-day would yield a “clear direction” from the UK. Writing in the Observer, Sir Graham Brady, chairman of the 1922 committee of backbench Conservative MPs, urged cabinet ministers to unite behind Mrs May, warning the party was risking the “disaster” of a Labour government led by Jeremy Corbyn if it did not.